Subscribe to receive our latest updates directly on your inbox. Before the day even began today a friends online post reminded me of how powerful music can be and how strongly it can be linked to memories. Then as I sat in church today we talked about the fact that we all have a story and that stories are most effective when they are told. So today I’m going to share a story. A part of my own personal story. I’m not even going to hash through this post to edit it and try to make it sound pretty. It’s just going to be real, honest and a bit of my heart. So beware, it will more than likely be grammatically incorrect and far too verbose. (Pretty much how I talk!) If you can forgive those grievances feel free to continue reading. In the early fall of 2015 every time I took the stage I felt like a fraud and every time I stepped off it I didn’t think I’d ever go back. Spirituality, mentally, emotionally and physically drained I was at the brink of epic disaster and the end of my rope. Stepping out of ministry was as hard a choice as I’ve ever made but it was the right one. My wife needed her husband back. My kids needed their daddy back. Above all, God needed me to be broken to a point that I would relinquish control and give him my heart back. After what had previously been a really hard last few years (including 3 second trimester miscarriages that would rock our world along with a laundry list of other struggles) the road to recovery wouldn’t get much easier. A routine surgery for Steph would become anything but that (by the time she had her third surgery in 48 hours we weren’t sure she was going to make it) followed by becoming foster parents and growing our family by 3 additional kiddos for 5 1/2 months. Through it all however God has remained faithful. 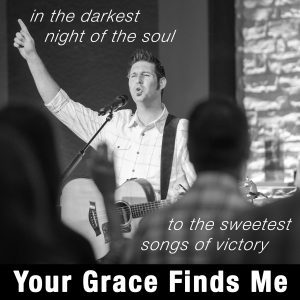 As Matt Redman’s song “Your Grace Finds Me” so eloquently states, in my darkest nights and sweetest victories alike His grace finds me. It has found our family as we’ve struggled and had to lean hard on each other. It has found us as we’ve shed countless tears and as we’ve laughed until it hurt. It has found us through the unwavering love, support, compassion and help of incredible friends to whom we will always be indebted to. It has found us in the care of family who jump in with the right words of encouragement or generosity when it was completely unexpected. It has found us in being able to worship together as a family as we heal, wrestle, doubt and have often even wondered if God was still listening. For me personally it has found me in the form of an incredible wife who loves me even amidst my faults and failures. In my kids that still count me as their hero even though I am so undeserving of that role. It’s been found in the words of those who have believed in me and spoken truth into my life. His grace has found me in my lowest moments, reminded me that I am His and that he is undoubtedly not done with me yet. It has found me as bits and pieces of myself have come back. As the spark in my spirit has reignited. As my resolve has strengthened to once again embrace God’s call and gifting in my life. Most recently it has found me through circumstances only orchestrated by His hand in the form of RockPoint Church in Schertz, TX, where as of this morning I was officially announced as their new Pastor of Worship and Creative Arts. I excitedly embrace this new opportunity as a different man than the one that last stepped off the local church stage in 2015. When I left ministry a few years ago I had said that I couldn’t be the leader God has called me to be until I first got back to being the man He had called me to be. Well, a few years later I think I’m going to amend that statement a bit. I still haven’t arrived. I don’t think I’ll ever fully be the man He’s called me to be… I’ll just be a man in pursuit of becoming the man He’s called me to be. Nothing more, nothing less. So here I go, a man in progress embarking on the next step of the journey and looking forward to what God has in store. I’ll just be a man in pursuit of becoming the man He’s called me to be. Nothing more, nothing less. Perhaps you are reading this post and you too happen to be wrestling with your own usability. If I can be of any encouragement to you, please don’t let these words fall on deaf ears or a hardened heart. God is NOT done with you. You are his prized possession and He is your greatest treasure. Whether you are in your darkest place in the depth of your soul or you are on the top of the mountain in victory, neither place and all those in between are NOT beyond a place where His grace can find you. His grace finds me. How about you? Copyright © 2019 AdamGreenLive. All Right Reserved.